These scones are bloomin’ marvellous! Oh, don’t mind me over here blowing my own trumpet. It’s just that I could eat these all day, every day. They are (as most really, really good baking recipes are by my standards) adapted from my Mum’s recipe – so are inevitably going to be scrummy. I would be in a lot of trouble from Mother Hen but, she doesn’t know how to “do a blog” as she says. And well, what’s the point in me spending time teaching her how easy it is? When once she’s in front of the screen, mouse in hand, she’s going to get **new technology fear!! Get me a pen and a piece of paper!! ** syndrome and forget everything I’ve told her. So I’ll give her the credit she deserves but put it up in full glory on my blog. This recipe is adapted from her basic scone recipe, with my added twist of chocolate. And the pear compote is a perfect pairing (and my own recipe!). So actually, this dish is almost entirely my own creation. Mum, you’re lucky you got a mention! Scones are just perfect for this time of year. Like most people, the darkening days and change in weather has got me down. I remember writing something similar around this time of year last year, when I made soup. This year, the comfort factor has been taken up a notch. Warm, sweet scones are the perfect comfort food and taste of home, alongside a big cup of tea, naturally. And they could be said to be very en vogue what with Bake Off and Downton (follow the links if you’ve been living under a rock or if you are not familiar with these British obsessions) back on our screens. So over the winter period, on a Sunday night when most of us can be found snuggled under a blanket in front of the box, I would definitely recommend trying these British classics. And of course this recipe can be adapted to incorporate your favourite flavours – apple, hazelnut, lavender, orange and chocolate whatever takes your fancy really, this recipe definitely allows for experimentation. 1. Peel and chop the pears into small cubes. Put all the ingredients into a microwavable bowl. Then follow the same instructions here for my microwavable jam. You should not expect a jammy texture for this compote though – it is much more dry and the pears do not break down as much. However look out for a change in colour. The pears should darken a little and soften slightly. The texture you’re left with goes perfectly with these scones. 1. First put your oven at 200ºC on to preheat so it is well heated before the scones go in. Butter and flour now resembles sand! 4. Once the mixture comes together, tip out onto a well floured work surface. 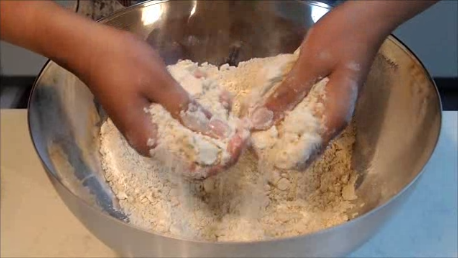 Knead slightly to remove any cracks in the dough. Be gently though as you don’t want to knock out all the air and over work your dough. 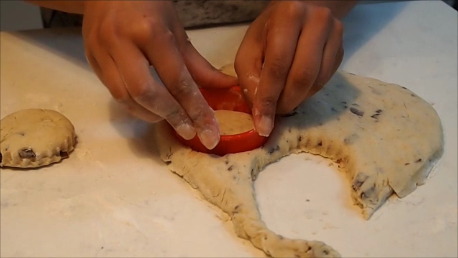 Flatten out using your hands until the dough is 1.5cm in thickness. 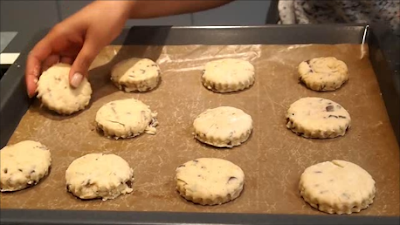 Use a 6cm pastry cutter to cut out your scones. (If you don’t have a pastry cutter you can use a knife to shape them manually or trace round a bottle – just try and keep them all the same shape so they cook at the same rate.) 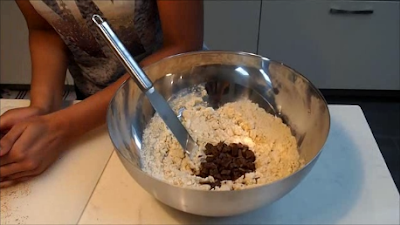 You should get around 10-12 scones from this mixture. 5. Transfer onto a baking sheet lined tray. Give the scones space between them as they will expand. Brush each scone with some milk – this will give them a lovely golden sheen. Bake in a preheated oven for 10-12 minutes at 200ºC until golden brown. 6. Once baked transfer onto a cooling rack. You can have them warm or cold. I like them best warm, with a dollop of whipped cream and a spoon of pear compote. Delicious! I think I'm ready for Bake Off and Downton! // Click here to PRINT RECIPE // Pssst - don't forget:- if you like what you read enter your email address into the box on the side at the top ----->. Don't worry I won't spam you or anything! You'll just get an email every time I write a new post :) And you can now follow me on Twitter, Pinterest or Bloglovin' too!